"Millard's suggestions are suprisingly accurate given how much the theory of the game has progressed over the last 60 years. "Chris Bray, in What Colour is the Wind? I. How Old Is Backgammon? II. How Is the Game Played? 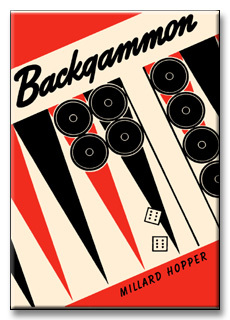 COVER: Backgammon, one of our oldest games, has an enjoyable mixture of skill and chance. The author, the world's checker champion, has devised a new approach to the understanding of this popular game. He avoids the confusing repetition of terms and phrases. By gradual steps he shows how to develop winning strategies for each phase of the game. The diagrams which use dotted lines and arrows to show the exact movements of the plays leave nothing to the imagination. The "tables of chances" giving relative values of luck are as easily understood as the multiplication table. Here, then is a book that will help you enjoy this fascinating game and will give you principles of winning backgammon. AUTHOR: The author of Checkers was a protege of the famous New York Giants pitcher and checker master "Christy" Mathewson. Mr. Hopper has represented America in International Teach Matches and has played and beaten such masters as Heffner, Schaefer, Ginsburg, Bradford and Gonotsky. He has also defeated many state and regional champions, among them: Chapman, of Maine; Evans, of Connecticut and Jesse Hanson, Pacific Coast Champion. Mr. Hopper's title of Unrestricted Champion was achieved in a ten game match with Alfred Jordan, Champion of Great Britain. Radio and television broadcasts on checker; playing at the New York World's Fair and playing 50 games at one time are other Hopper achievements.